We will also provide oral hygiene instructions on proper flossing and brushing technique. Periodontal Maintenance cleanings are performed following periodontal therapy (Scaling and Root Planing). During this appointment, bacterial plaque and calculus both above and below the gumline are removed. Periodontal Maintenance intervals are determined through a clinical evaluation by Dr. Evon Heaser and your hygienist. Though your mouth may feel healthy and you may not have any symptoms, periodontal disease can progress without a patient knowing. In fact, 70% of the population has periodontal disease. Periodontal disease and gingivitis occur when bacteria from plaque colonize on the gingival (gum) tissue, either above or below the gum line. These bacteria colonies cause serious inflammation and irritation which in turn produce a chronic inflammatory response in the body. As a result, the body begins to systematically destroy gum and bone tissue, which may cause the teeth to shift, become unstable, or completely fall out. The pockets between the gums and teeth become deeper and house more bacteria which may travel via the bloodstream and infect other parts of the body. If left untreated, periodontal disease can destroy the supporting bones in your mouth. This is why early treatment and prevention is so important! Periodontal Scaling and Root Planning (SRP) is a non-surgical procedure performed by one of our licensed hygienists. SRP is the initial treatment for Periodontal Disease, which is the loss of jaw bone supporting the teeth. 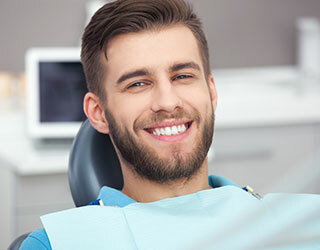 A careful cleaning of the root surfaces removes plaque and calculus (tartar) from the deep periodontal pockets and smoothes the tooth root surfaces. We typically use our needles anesthetic for this procedure. Patients will require ongoing Periodontal Maintenance care to maintain oral health.